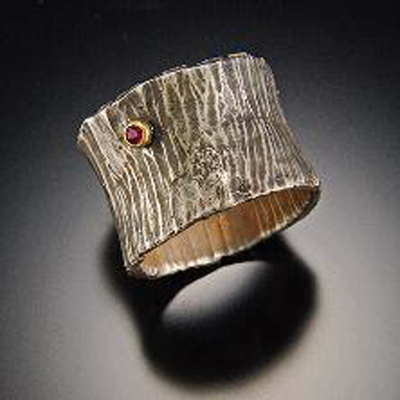 I handcraft my jewelry to showcase a rugged but refined primitive look. The inspiration that goes into my Jewelry comes from the primitive adornments made in Africa, South America and regions of Afghanistan and Turkestan. I like uneven textures and patterns. I am not interested in perfection, straight lines or clean shiny stylized forms. I am intrigued by designs that show a very human quality, like a realistic flaw here and there or overlap of a seem or a uneven pattern or a missing dot in a continuation of dots. I have always been really struck by the carpets and textiles that come from Afghanistan and Turkestan, and how certain patterns would be suddenly filled in with a different color or stop all together, or a new stitch pattern would suddenly develop half way through the making of the carpet. Leaving, me to wonder if the maker simply ran out of that color yarn and took up a different one. These somewhat random but human imperfections are beautiful to me. So my jewelry has a bit of this quality.